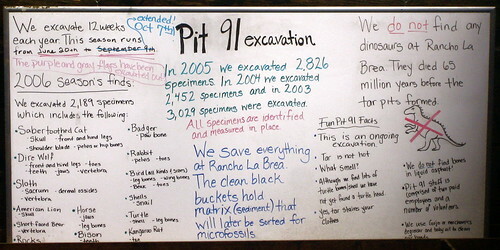 Pit 91 FAQ, originally uploaded by M.V. Jantzen. In a couple hundred thousand years, I wonder if advanced lifeforms will be enearthing the remains of today’s Angelenos, with their ornamental Bluetooth headsets, smoke belching leaf blowers, and crazy four wheeled people movers. Can I leave my vegan bacon + blueberry gelato request for Scoops here? Previous PostPrevious Swervedriver Tix from bLA! Next PostNext The Mayor is Leaving Los Angeles. Again.